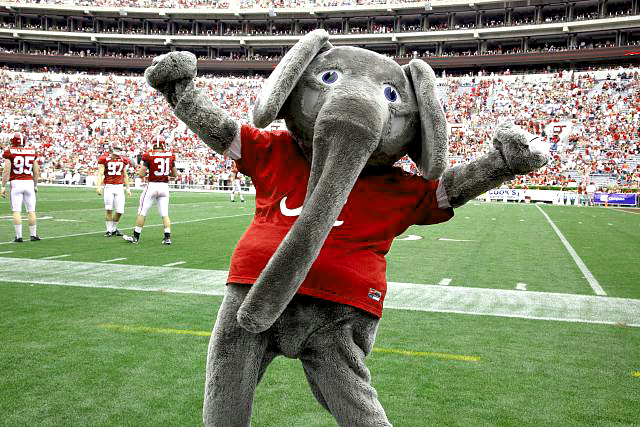 Big Al, the University of Alabama elephant mascot, dates back to the 1930s and the tenure of football coach Wallace Wade. During a game against the University of Mississippi, a fan in the stands referred to the Alabama linemen as "elephants" because they were larger than the Ole Miss players; journalists soon began referring to them as the Red Elephants. Courtesy of the Carol M. Highsmith Archive, Library of Congress.